Time for tea? | Help! I live with my Italian mother in law! ← Paradiso…can we stay forever? Oh my God! Our new neighbour is the Duchess of Westminster I think! For the past year there have been some dramatic changes up on this tiny hill. For starters, the large property next to ours was cleared after more than 30 years of neglect. My husband said the new owners “cleaned it up”. Who are these new owners and why did they cave into pressure from the Commune to clean it up when the last owner obviously managed to ignore their warnings for thirty years? You see, although Portofino mountain is a natural and protected park, and the wild boar seem to rule the land at times, Italians have laws about keeping your yard tidy. It stems mostly from the threat of fire and that if a property is unkept it will be a fire hazard to all that surrounds it. Our neighbours are also building a fence which is great because their property butts up against ours and so we will save some costs on fencing the entire property ourselves. We finished the bottom half which took a total of three days and three and a half men (my husband helped occasionally). So, back to the Duchess…I was told that the people who bought the land next to us also bought a house on the other side of the hill. At first my husband just said it was some British woman who bought it and that she was rich and somehow connected to the Royal family. As you can imagine, I was thrilled to have an English speaking neighbour and envisioned road-side meetings and sharing afternoon tea. Maybe we could even have tennis dates! But when he mentioned the Royal family, my imagination turned to some pink haired stuffy who liked wearing big hats, *le sigh. So Google’s best guess is the Duchess of Westminster. I am of course not 100% certain, but if it’s true, then she isn’t some old, pink haired dame after all. She is only seven years older than me and in her photo she looks like a normal, nice person. Cool! Although, I doubt I will be getting any invitations for tea any time soon. My social circle barely includes the tennis instructor dude who I will occasionally wave hello to. On the other hand, I wonder if it’s good form to bring over a basket of home grown olive oil and honey as a “welcome to the neighborhood” gift? Heehee. For now, Coco will continue to be my trusty tea partner, although at the moment she is pretty ticked off at me because I ran out of wet food and don’t feel like driving into town to buy more. I have been getting the vocal complaints and whiney meows all day, sheesh! 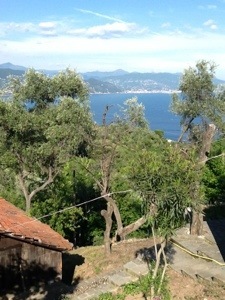 This entry was posted in Italian Culture, Nature, Tourists, travel and tagged Duchess of Westminster, neighbours, Portofino. Bookmark the permalink. 3 Responses to Time for tea? Oh Lin, there’s a great idea…give the cat some caffeine hahaha.